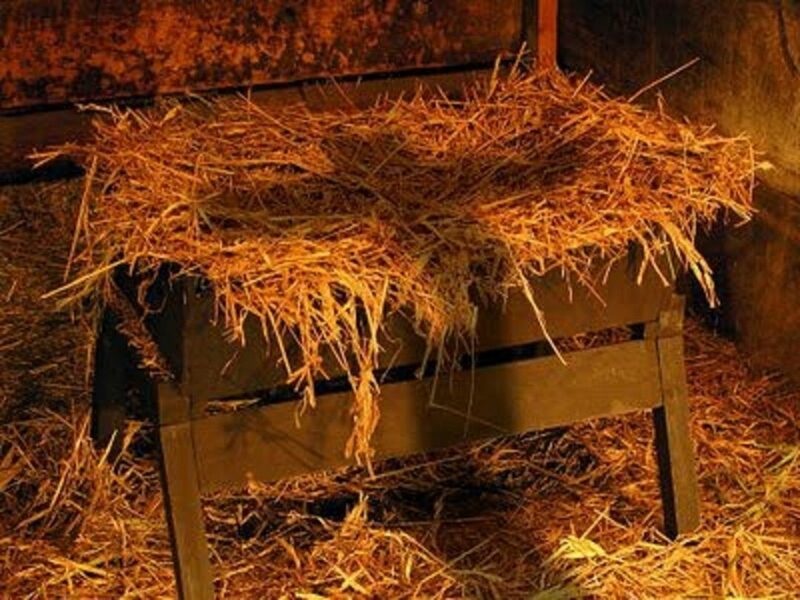 A manger contains food for animals, it is made of a mixture of bricks with straw; which is chopped wheat stalks, or may be made of wood or stone. The question now is why did the Lord choose to be born in a manger?! Let us consider together the meaning of a manger through this introduction. Had the manger be made of mud putty with straw, it draws our sights to the great mystery of the Incarnation. Man was created from mud which accepted from God the breath of life, and we remember how Jesus to whom is all glory spat on the ground and created eyes for the blind man. The straw carries the grain of wheat. This manger which bore the Word refers to our earthly Union with the grain of wheat; Christ the child who was wrapped in cloth and is lying in the place of feeding, not to animals but to all who believe in Him, baptized under His name and receive the mystery of the Eucharist . The Lord offered us Himself as a grain of wheat in a manger, a grain that dies for us, that we eat to live, bearing much fruit in us” Most assuredly, I say to you, unless a grain of wheat falls into the ground and dies, it remains alone; but if it dies, it produces much grain” ( John 12:24). If the manger was made of wood, it would remind us of the Ark of covenant, which was made of acacia wood, which does not rot. It contained all what symbolizes the Son of God the incarnate. The golden manna measure that contained the white manna that tasted like ” wafers made with honey” ( Exodus 16:31), referring to the pure body of Christ, without sin. Jesus challenged the whole world and asked” Which of you convicts Me of sin? And if I tell the truth, why do you not believe Me? ( John8:46). Also in the Song of Songs He is described as” His mouth is most sweet, Yes, he is altogether lovely. This is my beloved, And this is my friend, O daughters of Jerusalem! ( Song of Solomon 5;16). As for the two tablets of covenant that were in the Ark, on which the Ten Commandments were written, they refer to the Word of God written On our humanity in flesh and blood and not just on harsh stones like the heart of Israel which rejected the Divine savior” Inasmuch then as the children have partaken of flesh and blood, He Himself likewise shared in the same, that through death He might destroy him who had the power of death, that is, the devil” ( Hebrews 2:14). Also it included the rod of Aaron the priest that clearly refers to the priesthood of the Godly manger Newborn” The Lord has sworn And will not relent, ‘You are a priest forever According to the order of Melchizedek” (Hebrews 7:21). Then the wood immediately draws our attention to the wood of the Cross, that carried the Lord in Golgotha, being used to the roughness of wood since He was born, preparing for offering His body as a sacrifice for the sins of the whole world, crucified on the cursed tree” though He was a Son, yet He learned obedience by the things which He suffered” ( Hebrews5:8). Manifesting His obedience to the Father since He was in the womb” And being found in appearance as a man, He humbled Himself and became obedient to the point of death, even the death of the cross”. (Philippians 2:8). Finally, the manger can be made out of bricks. And we know that the heavenly born is the Corner Stone, Which was not cut by hands, because He was born from the Virgin without a human seed, striking the evil, sin and satan all together, becoming a great Mountain that filled the whole earth,fulfilling Daniel’s interpretations to Nebuchadnezzar’s dream ( Daniel 2). Haven’t we seen how disturbed was King Herod for the birth of the Corner Stone in a manger?! When the magi came to Jerusalem asking about this Newborn, the Book says” When Herod the king heard this, he was troubled, and all Jerusalem with him’ ( Matthew 2:3). Yes Lord, when we look at your manger we see you as the Son of God and at the same time the Son of man, for you are God and Man except for sin” The stone which the builders rejected Has become the chief cornerstone. This was the Lord’s doing, And it is marvelous in our eyes” (Matthew 21:42). Isaiah says” For unto us a Child is born, Unto us a Son is given; And the government will be upon His shoulder. And His name will be called Wonderful, Counselor, Mighty God, Everlasting Father, Prince of Peace” (Isaiah 9:6). A Newborn full of light, how did You hide Your glory in this mysterious Divine way?how for my salvation have You agreed to be born in an animal’s manger wrapped in poor cloth?! Surrounded by animals and I am trembling Of Your Holy glory, You who is the eternal Word of God, through Whom everything was created. I wonder how the poor shepherds came running in fear and joy together, telling Mary and Joseph how they saw and heard the good news of the birth of the Savior from a chorus of singing Angels?! So I dared To come closer to Your manger when I saw You did not prevent the kind animals from looking at You and the poor shepherds from coming close to You. And between this and that I see Your mother the blessed virgin in quietness and strength looking at You and listening to what the shepherds had to say preserving all in her heart. I asked her if I could look at the manger’s baby?! She nodded saying yes, then I was more encouraged to even ask to carry the newborn and kiss Him?! I found no objection, so I rushed towards Him and carried Him with all love and longing and kissed Him, and I felt Him blowing of His breath in me, and all humanity which died in the first Adam , the breath of life So we can live forever and not die, so I realized that He is the Last Divine Adam” And so it is written, “The first man Adam became a living being.” The last Adam became a life-giving spirit” (1 Corinthians 15:45). O You who were born in the manger, I come today running towards You, with all those who come to you, so we can be born in You, and for You, so we can be in You, and You in us? Carrying You in us, and You carrying us to the heavenly” and raised us up together, and made us sit together in the heavenly places in Christ Jesus”. (Ephesians 2:6).